I really am into A MOB’s Omerta album and love the music on it but come on!! I watched That Metal Show when Mike was the guest drummer & Russell Allen & Mike Orlando were guests. MP was like “this is what what I want to be playing at this point in my life” and seemed to be excited about being involved with this band. Maybe he needs to stop f**king around with all these damn side projects and decide where his loyalties lay. Start one band and see it through to the end. Don’t bullsh*t the fans by acting all into the music your making ATT and then bail when you have too many irons in the fire. IF your that into this new music that your making and that dedicated to the band your in, side projects should NOT interfere with your main band. I hope A Mob can find a drummer that can handle the duties and do the music justice and NOT bail on them because of some other project. 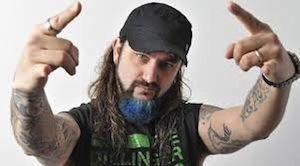 Maybe his next project can be with his buddy Geoff Tate? Bwahahaha. …so you don’t think that he’ll be annoucing next summer that he is leaving the Winery Dogs? He does too many projects then walks away from them a month or so after the release. Its hard to keep track of everything he is up to. IMO, too many side projects for some of these musicians(not just Mike). I love DUg Pinnick be he is another one w/ too many side projects. I guess thats how they make a living now days but c’mon. Couldn’t agree more GC, except for the fact that I’m sure he’ll leave the Dogs way before next summer. He’ll probably then announce a new super group with Scott Weiland and Peter Criss and call it PMS….get it?